I've realized that I need to start taking this blog back to its origins instead of only talking about soap products. At some point, my soapy stuff will take on a life and blog/website of its own, so I need to steer this boat back into familiar territory - FOOD! Today, I am bringing you Roasted Sticky Chicken. I don't know exactly why it's called "sticky" when there aren't any ingredients that would cause it to be sticky, nor is it actually sticky IMO. 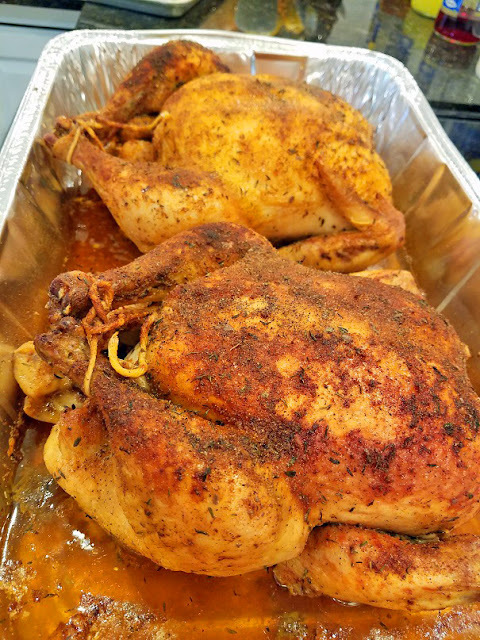 I can tell you that I've been making this chicken for over 10 years, and I am always amazed at how good and simple it is to make. Also, I can tell you it is simply delicious and worth the amount of time it takes to make it. This is a set-it-and-forget-it type of recipe and it's the perfect thing to make on a cold fall or winter Saturday when you are tucked inside the house doing other things. It requires 5 hours of sloooooow and looooow roasting. Yes, that is correct...5 HOURS to roast. You would think roasting a chicken for 5 hours would dry it out to the consistency of shoe leather, but no, these birds are incredibly moist and fall-off-the-bone tender. 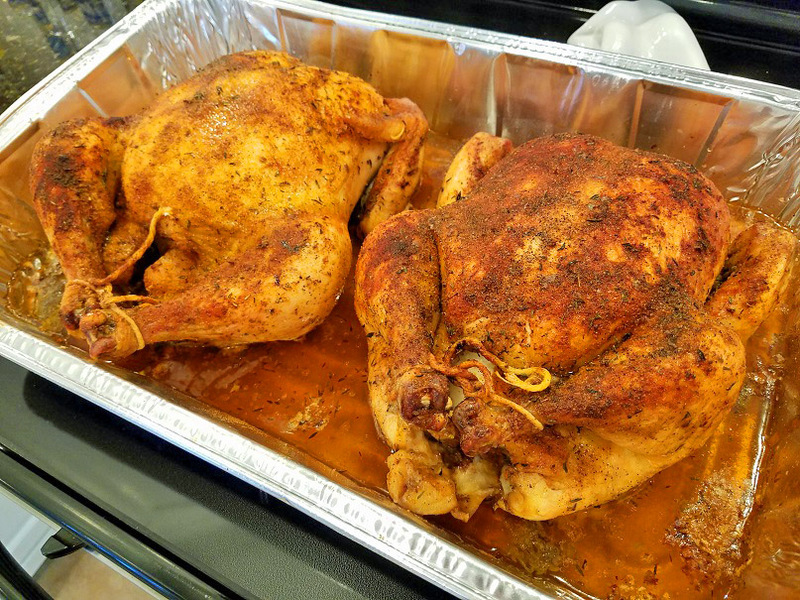 In fact, since it takes so long to make and it's worth it, I usually roast more than 1, 2, or even 3 birds at a time and freeze the rest. The meat freezes WONDERFULLY and does not dry out. That makes it perfect for future chicken salads, casseroles, soups, or simply served with gravy and mashed potatoes. YUM! Note: To roast more than 1 bird at a time (highly recommended), double or triple the seasoning amounts. Combine all spices in a bowl. Rub mixture into the chicken WELL, inside and out; patting into the skin. Place chicken in a large Ziplock bag or large enough container, and refrigerate overnight. If you don't have time for this (I rarely remember to do this), it will still be delicious! Preheat oven to 250°. Place quartered onion inside the chicken cavity and truss the legs closed. Tuck the wings under the bird. Place in a roasting pan and slow roast, uncovered, for 5 hours. Baste often with pan juices. The chicken will turn a delicious, golden brown. To freeze leftover chicken, pull meat off the chicken carcass and freeze in a Ziplock freezer bag. I often vacuum seal as well.